PLUSCO 180ET is an extreme temperature anti-seize lubricating compound. This anti-seize compound is formulated for use on areas subjected to high temperatures. PLUSCO 180ET Extreme Temperature Anti-Seize Lubricating Compound has a service rating of 1800°F (980 °C). It maintains its anti-seize and lubricating properties under the most demanding conditions. It will not run or drip as surface areas are heated. 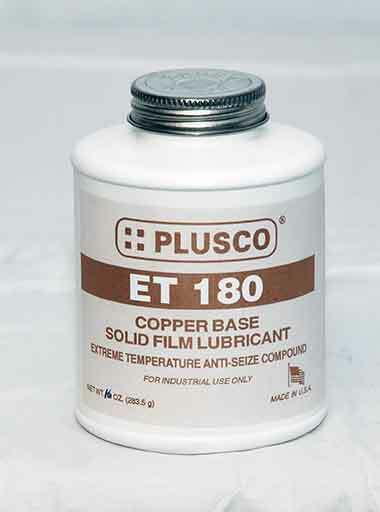 PLUSCO 180ET Extreme Temperature Anti-Seize Lubricating Compound contains no lead or other hazardous materials. PLUSCO 180ET Extreme Temperature Anti-Seize Lubricating Compound resists washout and the affects of salt water. It is non-corrosive and will not separate, or dry out, when applied to threaded surfaces. PLUSCO 180ET Extreme Temperature Anti-Seize Lubricating Compound will allow ease of breakout without damage to threads. PLUSCO 180ET Extreme Temperature Anti-Seize Lubricating Compound is recommended for low speed high torque bearings under high temperature conditions where galling and seizing can occur. PLUSCO 180ET Extreme Temperature Anti-Seize Lubricating Compound can be used on studs, bolts, threaded connections, flanges, dies, gaskets, key-ways and in areas where equipment damage can occur. Other areas of application include down-hole tool assemblies, pumps, boilers, steam turbines and heat reactors.